Leading British actors are more than twice as likely as stars in the music industry to have attended fee-paying schools, the Sutton Trust says. It also says professions like politics and the law continue to be dominated by privately educated Oxbridge graduates. The Trust said a child's chances of reaching the top still came down to their schooling and contacts. The government said the state sector was increasingly matching the private sector in terms of academic attainment. Researchers for the Trust, which campaigns for greater social mobility, looked at the educational backgrounds of more than 1,200 people, working in high positions in medicine, the law, the military, journalism, politics, the civil service, business, film and pop music. They also looked at Nobel Prize-winners. The report - Leading People 2016 - found that more than two in five (42%) of British Bafta winners went to a private school, compared with around a fifth (19%) of those who have been awarded a Brit music award. 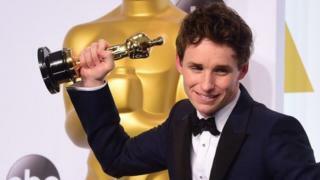 Also, two-thirds (67%) of British Oscar winners were privately educated, among them Eddie Redmayne, who went to Eton, and Kate Winslet, who studied at Redroofs Theatre School. The Sutton Trust suggested the successful state-funded BRIT school in Croydon, which counts Adele and Jessie J among its former pupils, may be one reason why the proportion of state-educated top music stars is higher. The research found that three-quarters (74%) of the UK's top judges went to a fee-paying school, and nearly eight in 10 (78%) went on to Oxford or Cambridge University. Among top military personnel, some seven in 10 (71%) were educated in the private sector, although just 14% were Oxbridge educated. Just over half (54%) of these journalists attended Oxford or Cambridge, along with 55% of solicitors and 51% of the senior civil servants included in the study. In politics, half the Cabinet were privately educated (including old Etonian Prime Minister David Cameron) compared with 13% of the shadow cabinet, and around a third (32%) of MPs. The current Cabinet does have fewer former independent school pupils than the coalition cabinet of 2010, the report notes, but slightly more than Tony Blair's post-election Cabinet in 2005. Just under half (47%) of the current cabinet are Oxbridge graduates, along with 32% of the shadow cabinet. The trust said that of the country's top doctors, 61% were educated at independent schools, nearly one-quarter at grammar schools (22%) and the remainder (16%) at comprehensives. The private school sector educates 7% of the population. "The top of many of the UK's most prestigious professions remain disproportionately constituted by those with elite educational and socio-economic backgrounds," the study says. Sutton Trust research fellow Dr Philip Kirby, who wrote the report, said: "Young people from more advantaged backgrounds often have broader professional social networks, which can be used to access certain jobs, as well as parents who might be more able to support them through unpaid internships, which are increasingly important for career development." Chairman of the Sutton Trust Sir Peter Lampl said: "Our research shows that your chances of reaching the top in so many areas of British life are very much greater if you went to an independent school. "As well as academic achievement, an independent education tends to develop essential skills such as confidence, articulacy and team work which are vital to career success. "The key to improving social mobility at the top is to open up independent schools to all pupils based on merit not money as demonstrated by our successful Open Access scheme, as well as support for highly able students in state schools." A spokesman for the Department for Education said: "Thanks to our reforms - which are underpinned by a total commitment to social justice - 1.4 million more pupils and counting are being taught in good or outstanding state schools than in 2010. "As the independent Good Schools Guide has recognised - the state sector is increasingly matching the private sector in terms of academic attainment and learning environment. "University entrants are at an all-time high, with rising numbers of children from disadvantaged backgrounds going to university and the number of disadvantaged students attending Russell Group universities doubling since 2010. "We are determined to spread this educational excellence everywhere, extending true social mobility for all. We are continuing the pupil premium at current rates for the duration of this parliament."